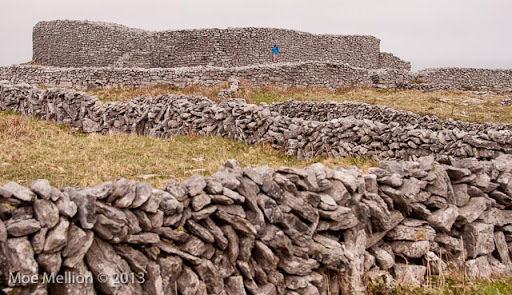 Inis Mór, the largest of the Aran Islands, located off the southwest coast of Ireland, is a mass of stone and stones. 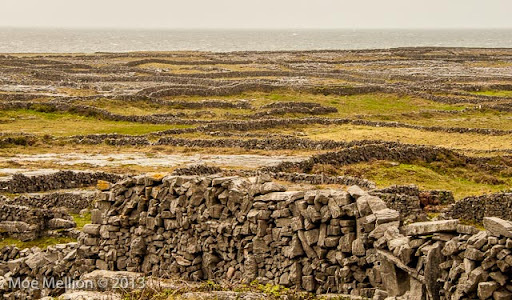 According to Wikipedia: "A lacework of ancient stone walls (1,600 km or 1,000 mi in all) enfolds all three islands to contain local livestock. 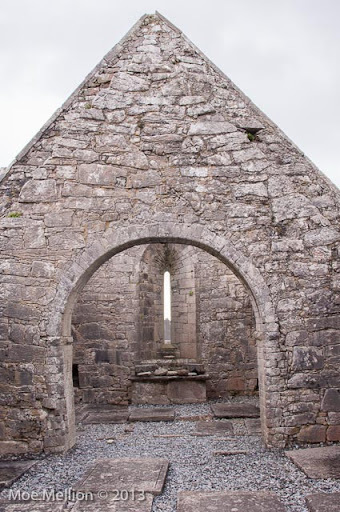 . . Enda of Aran founded the first true Irish Monastery near Killeany (Cill Éinne or Church of Enda). 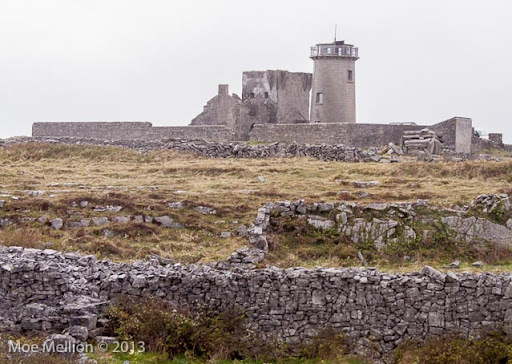 In time there were a dozen monasteries on Inishmór alone. 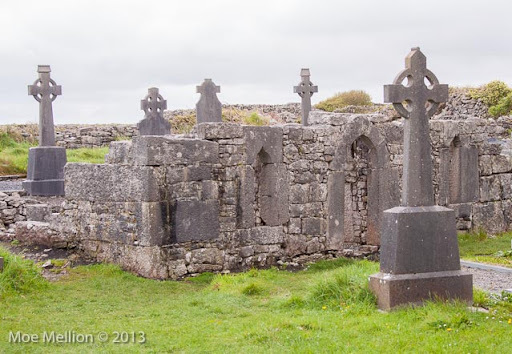 Many Irish saints had some connection with Aran . 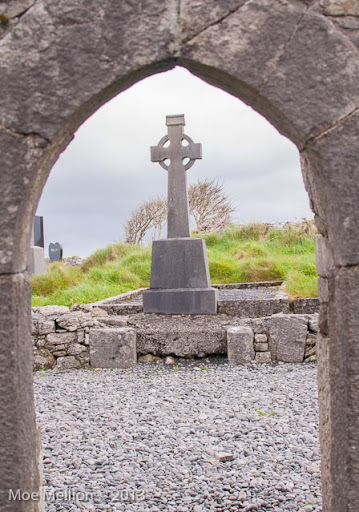 . .
"The islands were first populated in larger numbers probably at the time of the Cromwellian conquest of Ireland in the mid-17th century, when the Catholic population of Ireland had the choice of going 'to hell or to Connacht.' 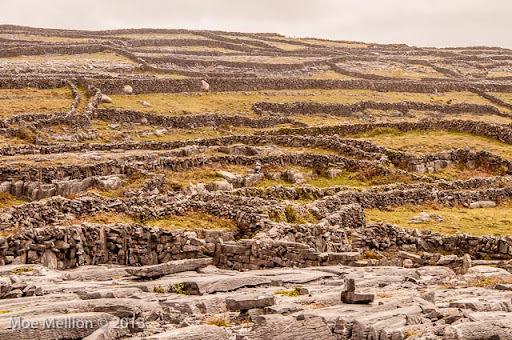 Many fled to the numerous islands off the west coast of Ireland where they adapted themselves to the raw climatic conditions, developing a survival system of total self-sufficiency. 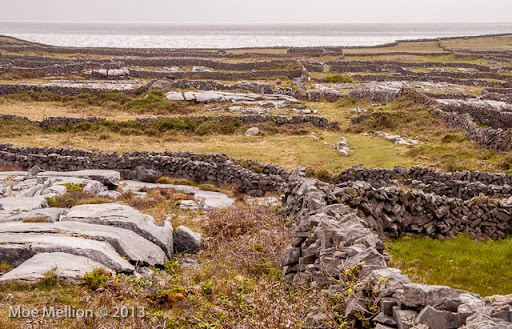 Their methods included mixing layers of sand and seaweed [and clay] on top of rocks to create fertile soil, a technique used to grow potatoes and other vegetables The same seaweed method also provided grazing grass within stone-wall enclosures for cattle and sheep"
Looking at theses images, you can see the "lacework of stone" as well as areas where the flat layers of stone remain uncovered and grassy plots. 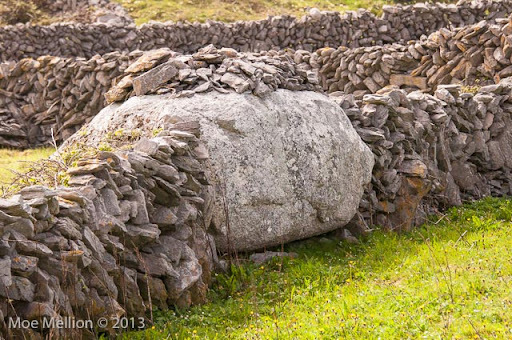 The stone walls have a dual benefit. 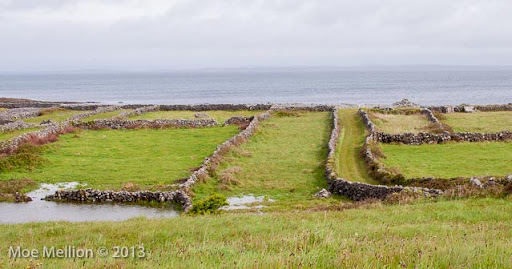 By removing the stone from areas with a bit of soil, the farmers started with small plots and then added sand, seaweed and clay, which they hauled in with buckets. Over time, cow and sheep manure and more seaweed was added; and the soil grew and improved. Meanwhile, the walls they built provide good pens now for cows, sheep and horses. The photograph below show mature fields filled with nutritious grass. The pooled water resulted from a heavy rainstorm the night before. The next photograph shows a hand made rain catch and trough for grazing animals. 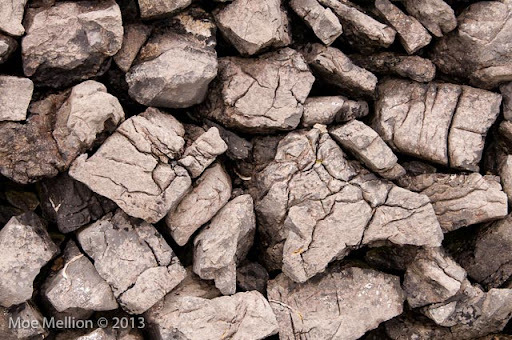 Rocks of different sizes and shape provide a variety of wall patterns. 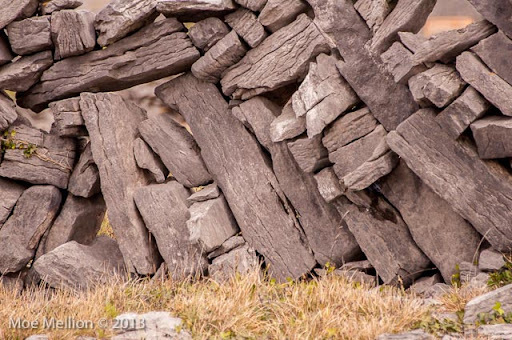 Some rocks were too big to be moved; so, the wall was built around them. 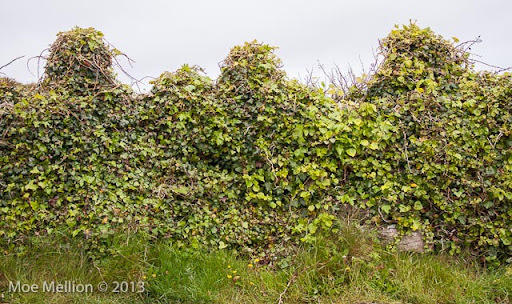 Occasionally, a wall is totally covered with overgrowth. 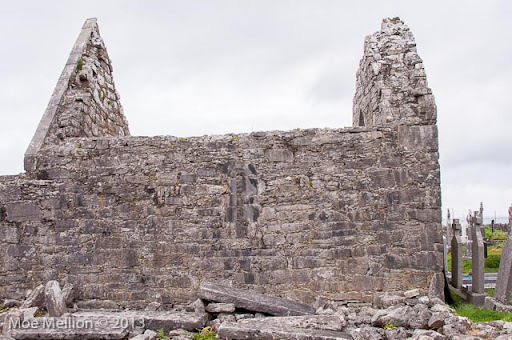 These images are from the remains of the Seven Churches, which actually were two small churches and five monastery buildings. 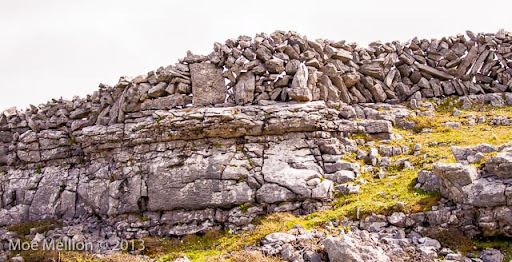 Again, according to Wikipedia: "On the cliff tops, ancient forts such as Dún Aonghasa (Dún Aengus) on Inishmór and Dún Chonchúir (Fort of Conchobar) on Inishmaan are some of the oldest archaeological remains in Ireland." 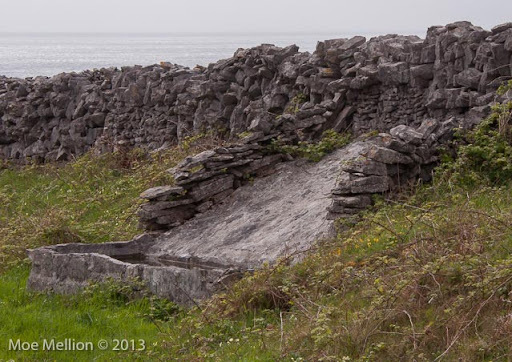 The remains of two forts on Inis Mór are shown here. The bule spot on the fort below is Irene. In the early 20th century this stone building was constructed to convert seaweed into products for the marketplace on the mainland. 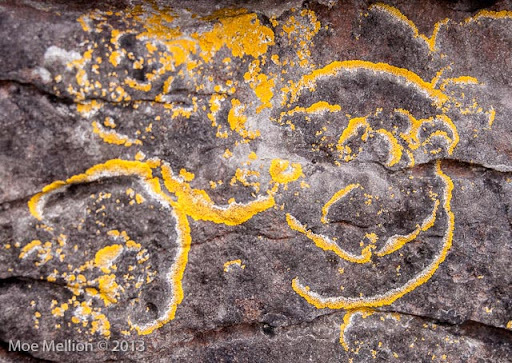 Some of the rocks have been decorated by nature with beautiful lichens. 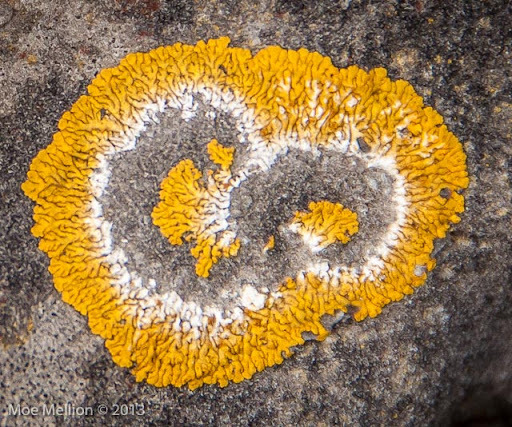 Do you see smiling images below?